With a taste, texture and nutrition that consumers know and love, it is fast becoming a new food staple for many families across North America and beyond! 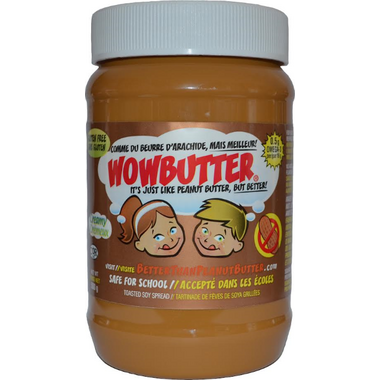 WOWBUTTER has simple ingredients with no artificial colours, flavours, preservatives or fillers. Made in a Dedicated 100% Peanut Free, Tree Nut Free, Gluten Free, Dairy Free and Egg Free Facility. It is produced in a dedicated facility that manufactures only soy products. Ingredients: Toasted Soy, Soy Oil, Granulated Cane Sugar, Monoglyceride (from sustainable palm oil, prevents oil separation) and Sea Salt. All Ingredients are sourced from non-GMO sources. Not a big fan of this product.. the taste is extremely strong and leaves a lingering bad taste in your mouth. I find it also feels like what Iâ€™m assuming cornstarch would taste like, starts out smooth but slowly dries away any ounce of moisture from your mouth so you feel like youâ€™ve just eaten a spoonful of powdered chalk.. not a favourite product around here..
Our family loves this! The taste is amazing and it's made with simple ingredients which makes it a staple in our home. Perfect for sending to school with peanut free stickers included on the jar. Try it! I absolutely love this product! I just wish it came in larger sizes. With nut allergies, this makes a perfect substitute for peanut butter and it comes with stickers showing that it is peanut/nut free so kids can take it safely to school.